Glycosylation is an important post-translational modification of protein. 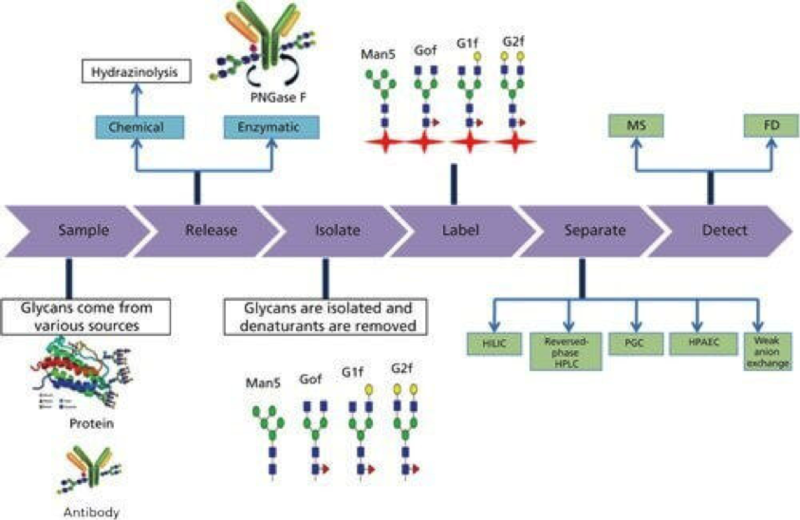 The types of glycosylation of protein can be classified into N-glycosylation and O-glycosylation, depending on the types of connection between the peptide and sugar. N- glycosylation is connected by the N- acetylglucosamine (Glc-NAc) at the reduced end of the sugar chain and the nitrogen atoms on some of the Asn side chain amino groups in the peptide chain. The Asn connected to the sugar chain must be in the motif made up of Asn-X-Ser/Thr 3 residues, in which X is an arbitrary amino acid residue with the exception of Pro. The structure of O-glycosylation is simpler than N-glycosylation, and the sugar chain is short, but with much more diversities. O-glycosylated peptides are mainly linked to sugar via Ser and Thr residues, however, some types of O-glycosylation may be connected by tyrosine, hydroxyllysine and hydroxyproline residues. MtoZ Biolabs uses Obitrap Fusion Lumos mass spectrometry and Byonic software for glycan profiling analysis of the peptides, protein and antibody drugs. The system has been optimized for determination of the composition of glycosylation and the sites of N-O-glycosylation of peptides or protein. In this project, the coverage rate of peptide is 94% compared with the theoretical sequence, and 6% of the unidentified sequence is signal peptide, which has been cut off in the process of recombinant protein secretion, so the actual peptide coverage rate is 100%. 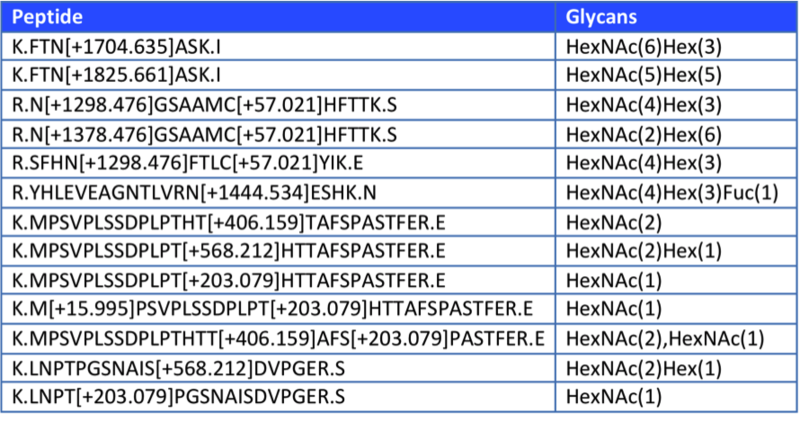 In the final experimental results, we will also provide ms/ms information for each of the identified glycopeptides, as shown in the following figure.